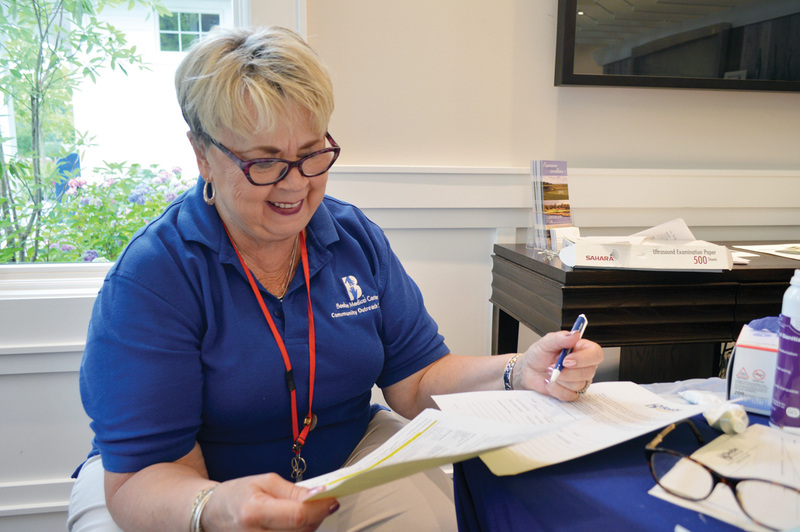 Beebe Nurse Ronni Smith laughs while telling a reporter to exercise more, as she administers health screenings at the Bayside Institute’s Wellness Week. I was furious. I was several days into a crummy mood, and I had just slept through the meditation class that was supposed to make me feel less crummy. I had killed my phone earlier that week, overloading the last of its storage with concert videos and then watching the battery skydive to 0 percent. Suddenly, I’m without an important work tool: my camera, audio recorder and instant fact-checker. That awoke other frustrations, and I was in a funk. I needed calm thinking. What better than to learn meditation — from a live person, not just a YouTube video. Well. Nice try, you dope. You overstayed your trip to Sleeptown. So now I had my foot on the gas, grumpily driving toward the Bayside Institute Wellness Week, where my meditation class was now ending. On this day I had chosen the mental health avenue: a good old-fashioned meditation class, followed by a Beebe Healthcare lecture on the impacts of love and support in the healing process. Beebe Healthcare’s nine-week Dean Ornish Program tackles the roots of heart disease with four major lifestyle changes: fitness, nutrition, stress management and love/support. Everyone knows that to avoid heart disease — you exercise, reduce stress and stop eating trash food. But when a person is surrounded by love and support, it means faster recovery times and less likelihood of cardiac issues, despite genetic predisposition. “It all goes together, the mind and the body,” said Kate Adamek, who guides the love/support group, which is a quarter of the Ornish program. At Bayside, we got 45 minutes of her Cliff’s Notes on empathy and communication. Rather than suppress, you have to recognize the pain and allow yourself to experience it, which totally bites (and is what my mother would call “having a good cry”). When we suppress anger, it builds until bubbling over. The key is to express anger or sadness in a healthy way. Yell into a pillow. Rip a magazine or phonebook in half. Take a boxing class to beat up a real punching bag, rather than turning that verbal or physical rage against a human punching bag. “It’s rage and anger that’s stuffed down that has a negative impact on our cardiac health,” Adamek said. She compared emotion to a 2-year old: Don’t let it drive the car. But listen if it needs a pit-stop, since you can’t contain a problem forever. Eventually, there will be a big mess. “To manage our emotions, we have to know what they are,” said Adamek. So, we practiced identifying our emotions. Sitting quietly with eyes closed, we identified all the topics on our mind that day, and then all the emotions we felt. Afterward, we opened our eyes and shared the emotions. Personally, I was simultaneously angry (cell phone, oversleeping, various failings) and excited (my friends and I were going out that night). I envied the man who simply felt “a sense of wonder” and assumed him to be a lucky vacationer. But maybe he just had a grandchild. Maybe he had just spotted a pod of dolphins for the first time. Next, the Ornish support group will also share why they feel their emotions, and then offer each other a chance to empathize. The goal is trying to connect and understand the feelings running underneath the situation. Unexpectedly, I found myself reaching for those words a day later, when my classmate’s husband passed away. Forget the disappointment of losing your phone, photos or work notes. Imagine losing the love of your life instead. In the nine-week Ornish program, the cohort builds intimacy quickly. As they listen to each other, they learn to judge themselves less. That’s important. We’re our own harshest critics. Afterward, I walked through the rain to my next event, still trying to forgive myself all my faults (they’re easy to list when I’m in a bad-enough mood). I’m not perfect, which is disappointing. I barely exercise, and I don’t eat enough leafy greens (as a Beebe nurse quickly deduced during a bone density test at the afternoon health fair). But if we humans were given a capacity for love and empathy, we have to use it — for each other and for ourselves.